September 5 Red Shirt action on Jom Riem beach, Pattaya. Photo by Gunn Redguy. 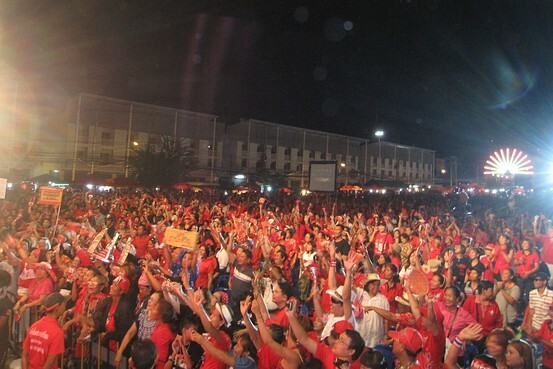 Thousands of Red Shirt supporters rallied at a concert in the Thailand seaside resort city of Pattaya on September 4, in what was one the biggest mobilisations since the military bloodily dispersed their mass protest camp in Bangkok on May 19, 2010, killing 91 and injuring thousands more. Red Shirt leader and Puea Thai party MP Jatuporn Prompan called on people to place red roses outside prisons around the country on September 17. Hundreds of Red Shirt leaders and activists continue to be detained. On September 18-19, actions marking four months since the massacre will be held all over the country as well as overseas. “Today is the beginning of our campaign to open the prison doors to let our Red Shirts brothers and sisters free”, Jutaporn told the concert. Jutaporn said that the government had accused him of refusing offers of reconciliation, of “putting out his feet” to its offers of a “handshake”. But how can the reconciliation happen, he asked, when the government was “offering its feet by giving bullets to us first”? See the a video of Jutaporn's speech at the concert HERE. One of the participants in the Pattaya rally, “Gunn” (not his real name for security reasons) sent Green Left photographs of a “die-in” action the following day on the beach organised by the “Red Sunday” group around outspoken activist Sombat Boonngamanong, who has serially defied the emergency laws prohibiting protests. In the September 5 beach action, Sombat organised games and street theatre on the beach and then a big beach cleanup. About 1000 people participated. A group of 10 uniformed police turned up at the end but just stood around with nothing to do! On May 21, Sombat and friends organised a gathering at a park on Lat Phrao Road in Bangkok to exhibit photos of dead protesters and stage a small performance. A large number of armed police arrived and dispersed them. On June 26, Sombat was arrested when he tied a large red ribbon at the Ratchaprasong intersection to commemorate the people killed by the military in that area on May 19. On July 11, just two days after he was released from detention, Sombat repeated his red ribbon protest on a signpost at Ratchaprasong intersection, together with hundreds of supporters (watch HERE.). Several of these protesters painted their arms red and lay on the ground next to posters reading: "People died here". On August 7, Sombat staged another symbolic protest by tying a red banner at the City Tower Clock of Chiang Rai province in order to denounce the authorities' harassment against five students who earlier staged a protest against the emergency decree in Chiang Rai. According to an August report in the Nation, one of the five students is just 16 years old. He was forced to have a check-up at a mental hospital by the authorities. Since then the Red Sunday group has organised numerous other symbolic actions, including mass exercise routines by red-shirted participants, dance competitions, die-ins and attempts to break through stifling internet censorship the Thai government has imposed. The Abhisit regime has begun trying some of the Red Shirt leaders on charges of committing terrorist acts, inciting unrest and holding illegal gatherings. Others remain in detention and some are still being denied access to lawyers. Sombat has promised to gather other Red Shirts to visit lesser-known Red Shirts activists in detention. Sombat doubted the willingness of the Law Society of Thailand to assist Red Shirts, adding that the society has a history of bias against Red Shirts. Emergency decrees, imposed in May, are still in force in Bangkok and in six other provinces. They have been lifted in some of the most popular tourist areas. On September 17-19, the Red Shirts will be protesting yet again. Thanks to several Red Shirt comrades, who must remain anonymous, for their assistance in writing this article.